COR has been the leader in board storage for over 14 years now. COR is a Family run company of Surfers and Paddle Boarders. Trust the brand that lives the life you do! We are the number one rack company because we stand by our products. This is the BEST Wall Rack you can buy! Super Strong and Heavy-Duty. If you are going to spend hundreds or thousands on a board, then make sure you are buying the best to keep your board safe! Please take some time to read some of our seller reviews. The COR Double Wall rack is one heavy-duty rack! This steel rack is easy to install and use. Just snap the arms in place and you are ready to go. Comes with some heavy-duty wall anchors to get your heavy longboard and paddleboards safe. All orders come with a moneyback guarantee. Dimensions: Height: 20.5" - Arm Width: 28" - Diameter of Rack Arm: 1 3/4" - Space between two rack arms: 10"
FREE Paddle Storage Hook with Purchase, a $20 value! This is the STRONGEST SUP Wall MOUNT out there. 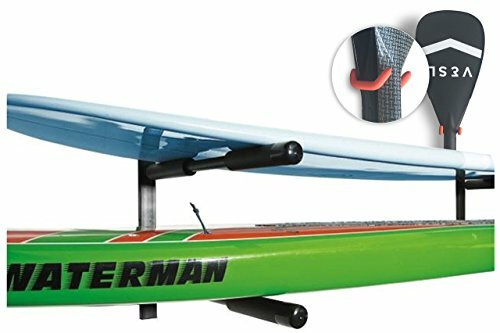 Maximum weight capacity of 100-pounds and stores any style of paddleboard or SUP. Perfect SUP Rack for the Garage! Easy to install, just snap them in place, and you are ready to go! Constructed of durable steel with a black finish, that can be installed inside our out. Mounting Hardware included. If you have any questions about this product by COR Board Racks, contact us by completing and submitting the form below. If you are looking for a specif part number, please include it with your message.